Hall-of-Fame trainer Woody Stephens won a lot of races in his illustrious career, but Saratoga’s premier event – the Travers Stakes – had eluded him until Claiborne Farm’s Forty Niner won by a determined nose in 1988. A copper-colored chestnut, Forty Niner was a son of Claiborne stallion Mr. Prospector out of home-bred stakes winner File, a young mare from the family of Swale. He came to hand quickly winning the Sanford S., the Futurity S. by three lengths, the Champagne S. by 4 1/2, and then edged out a nose victory in the Breeders’ Futurity at Keeneland. He did not run in the Breeders’ Cup that fall, but was still named Champion 2-year-old colt. 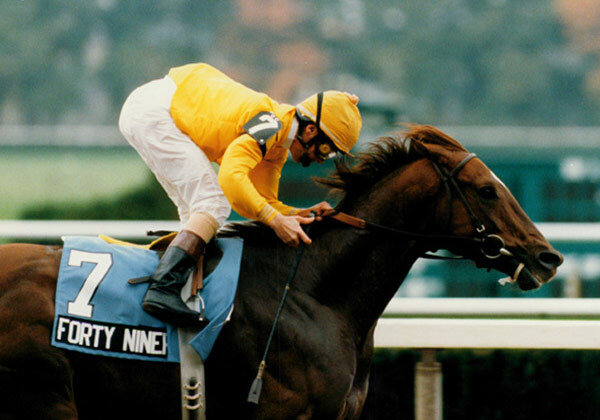 The following year, Forty Niner won or placed in the Fountain of Youth S., Florida Derby, Hutcheson S. and Lexington S. In the Kentucky Derby, he was second, closing strongly and only missed catching Winning Colors by a neck. He won both the Travers and the Haskell, each time after battling Claiborne-raised Seeking the Gold. He came within a head of older Champion and Horse-of-the-Year Alysheba in the Woodward S., and won the NYRA Mile. Every performance was characterized by his determination and desire. He won four major races by small margins and finished second in another by a length or less. “It’s like Woody says, he’s toughest when horses come to him – no horse fights harder when another horse tries to pass him,” said Claiborne’s Seth Hancock.